A Greek-style lamb dish, slow roasted in a wine and tomato sauce to ensure that the meat is very tender and the sauce is rich and full of flavour. Preheat the oven to 150°C, gas mark 2. 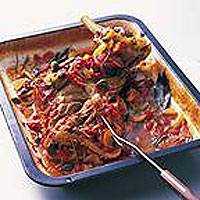 Season the lamb and place in a large casserole dish or roasting tin. Add all the ingredients, drizzle with the oil and season well. Cover with foil and cook for 2 hours. After that time is up, remove the foil and increase the temperature to 200°C and cook for a further 15 minutes or until the top is beginning to crisp and brown. Remove the meat from the dish. Stir the vegetables and juices well and serve with the meat and creamy mashed potatoes.